Star Wars News Net has uncovered a report claiming Disney licensees were “very impressed” when shown a Han Solo sizzle reel early last month. First spotted by Screen Rant, SWNN claims that a select number of the company’s licensees laid eyes on an early reel of footage from the Star Wars spinoff and walked away overly impressed with the film itself and Donald Glover and Alden Ehrenreich’s performances, in particular. 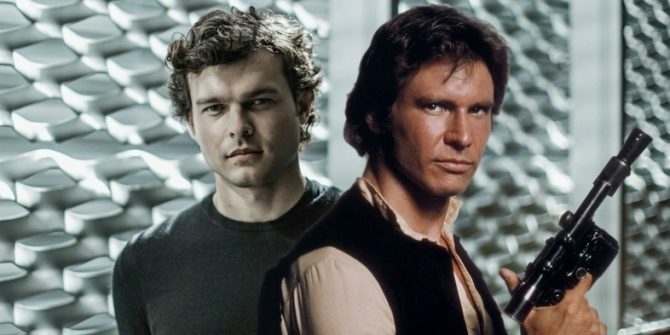 Keep in mind that, assuming SWNN’s sources are on point, this showcase would have occurred before the surprise firing of erstwhile directors Phil Lord and Chris Miller, who were let go by Lucasfilm after creative differences purportedly threatened to cause a rift between the directing duo and Lawrence Kasdan, the Star Wars mainstay who helped hash out a screenplay for Han Solo with his son, Jon Kasdan. Moreover, the fact that SWNN notes that those attendees were “especially impressed with Glover and Ehrenreich” ought to allay fears that the latter was struggling to cope in the leather boots of the galaxy’s greatest smuggler. After all, reports have indicated that Disney and Lucasfilm chose to bring on an acting coach to assist Ehrenreich on set, and though many considered that to be a glaring red flag, there’s every chance that Kathleen Kennedy and other Lucasfilm brass simply wanted to bring the very best out of the up-and-coming star. It’s impossible to gauge the veracity of this latest development, so treat this rumor with a heightened sense of caution. It does, however, present an interesting wrinkle to the saga, not least because it hints that a vocal minority of Star Wars fans have made a mountain out of a molehill. With Ron Howard now piloting the Millenium Falcon – with the blessing of George Lucas, no less – the untitled Han Solo anthology movie will zoom into theaters on May 25th, 2018.